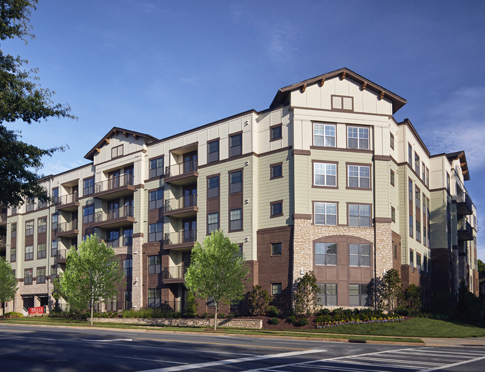 Solis Dilworth is a boutique, multi-family development located in the historic Dilworth community on the southwest edge of downtown Charlotte, NC. The 5-story apartment building wraps and conceals a 4 ½ story deck with 259 parking spaces. An exterior of stone, brick and siding is carefully designed to be compatible with the materials and human scale detailing of the nearby neighborhood of single-family homes. 184 apartments feature a variety of unit types and interior layouts. Studio, one and two-bedroom units average approximately 800 square feet of rentable area. Amenities include a courtyard pool with grilling stations, cabanas, lounge seating, and a rock waterfall. The pool has direct access to a clubroom with a catering kitchen, dining area, and a variety of seating options, and TV and billiard areas, a fully-equipped fitness center, and a yoga room. 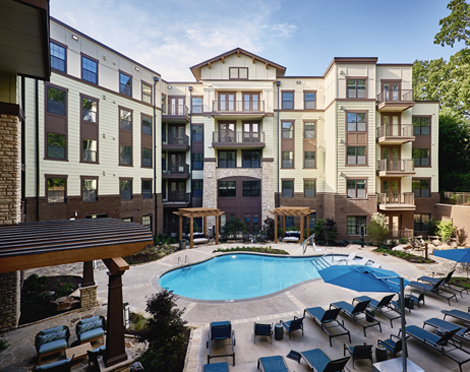 RJTR provided full architectural and engineering services for Solis Dilworth developed by Terwilliger Pappas Multi-Family Partners. The project is designed to achieve a National Green Building Standard (NGBS) Bronze Level Certification.